This carbon fiber Angle has a quasi-isotropic, symmetrical lay-up schedule. It is produced with a textured surface finish on both the inside and outside. The textured surface is created from a peel ply fabric, this surface is excellent for bonding. This makes our CF Angle ideal by itself or in conjunction with our DragonPlate Laminates to build an extremely stiff and strong structure. Angle can be cut and trimmed easily using a hacksaw/band saw or we can custom CNC angle to your CAD drawing. 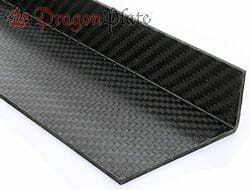 Quasi-isotropic Carbon Fiber Angle 1/32" x 1/2" x 48"
Quasi-isotropic Carbon Fiber Angle 1/8" x 1 1/2" x 24"
Quasi-isotropic Carbon Fiber Angle 1/8" x 1 1/2" x 96"
Quasi-isotropic Carbon Fiber Angle 3/32" x 1" x 24"